Craft Wars: Interview with Angela Daniels! Here at FaveCrafts we can’t get enough of TLC’s new show Craft Wars! 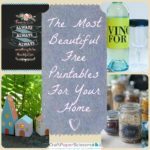 Not only is it fun to watch but we’ve gotten a lot of great tips and inspiration for future craft projects. Tonight, crafter extraordinaire Angela Daniels is one of the contestants and we have the inside scoop! We interviewed Angela about her experience on the show, her crafting style and got some great tips that we are sharing with you. Be sure to watch tonight’s episode to see if Angela wins! Who is your partner on the show? How did you decide? I had an easy choice. Pattye Duffner and I have know each other ever since we met on the set of the first (only?) online reality scrapbook show “Scrapbook LifeStyle.” Not only is she a talented crafter, she is hilarious and my main goal was to have a good friend to go on Craft Wars with me so we could have fun with the experience. Plus, she sews like crazy and I knew this was my big weak spot in the competition. I loved knowing I had someone with her interior design background and sewing skills in my corner and she DID make us all laugh all day during filming. Her microphone was linked to a PA assigned to us so even when I wasn’t in the same area as Pattye, I knew she was getting in a good jab at me because the PA would burst out laughing. Did you have any strategy going into the show? My strategy was to try to relax, have fun and try not to get to freaked out about winning. I can be extremely competitive with myself and I have a tendency to panic when I put too much pressure on myself. My secondary goal was to make sure Pattye and I walked away with our friendship intact. I hedged my bets on that one by taking her to a fancy restaurant on Rodeo Drive the night before we filmed as a thank you for being on the show with me. You know, just in case I lost my marbles during filming and started yelling at her or something (which, thankfully, I didn’t!). What’s your go-to crafting tool that you couldn’t create without? I love the simple tools. You won’t often see me buying the latest and greatest tools on the market. If I had to choose the most versatile tool that I keep in my craft bag at all times, it would probably be a bone folder. It’s invaluable for scoring things but it also helps with rub-on accents and a variety of other uses it wasn’t intended for. My favorite moment of the show was when I was able to look at a finished project (done JUST in the nick of time) for the briefest moment. It made me feel like Pattye and I had made something that we were proud of. That was a big goal of ours. We wanted to try and wow the judges, but mostly we just wanted to be able to watch the show with our kids back home and be proud of what we made together. What did you learn from the show? The best thing I learned from Craft Wars is that crafting is crafting. I was so worried about making something BIG. Like most crafters, everything I make is generally relatively small. I just didn’t know if I could do something large scale. As it turns out, and I should have known this, crafting big uses all the same skills and techniques as crafting small. All you need is more time and bigger supplies. I came home inspired to do some bigger home decorating projects with that confidence. Was it hard to stay true to your crafting style under all that pressure? If you asked me in the middle of a timed challenge, I probably would have said yes but now that I have had time to relax and reflect, the answer is no. No matter how hard I try to change up my style, it generally comes out the same. I like linear design. I like things that are relatively symetrical and clean. As much as I enjoy looking at shabby chic designs, my end project never comes close. My design aesthetic always veers in the same direction- linear and graphic. The pop craft challenge looks so difficult! What’s running through your head during the pop craft? Pattye and I had done a few less structured and less serious time challenges for the online show we were on years ago so I thought we would breeze through the stress of a timer. WRONG. At one point, I was struggling to thread a needle (I swear it had the smallest eye in the history of needles to make matters worse) and I was literally shaking with nerves. It felt like it took hours to thread that darned thing and I couldn’t believe I was on camera shaking as Pattye tried to lighten the mood by joking with me. I had to take a deep breath to keep it together! What’s your best advice for all the crafters out there? The most important piece of advice that I try to live by is to just DO it. I have a tendency to set an ideal of perfection so high that I don’t even want to start a project. And NOTHING I create ever comes close to looking like the ideal I had in my mind. This can either defeat me or I can realize that, hey, it’s just crafting. I’m not trying to save lives here. If I make a shoddy craft that ends up in the trash, I can live with that now. What I shoot for, always, is to embrace the process of creativity. The joy it brings me. To end on a bit of a bumper sticker-ism, it’s about the journey, not the destination. Check out Angela Davis on Twitter as @GuiltyCrafter and find her crafting tutorial videos on her Youtube channel. If you are loving Craft Wars or just need some crafty questions answered be sure to tune in to FaveCrafts Radio starting at 11am EST. We’ll be talking to Craft Wars vets Lisa Fulmer, Andrea Currie, Margot Potter, and Angela Daniels! You can hear them talk about their experiences on the show, the pressures of crafting with limited materials and time, and how life has been for them after the show. The best part? You can call in and ask all your Craft Wars questions live! Just call 646-200-4435 if you have a question for these crafty ladies. Be sure to watch as Angela goes head to head with two other crafters in tonight’s episode of Craft Wars on TLC at 8/7c! Have you been inspired by any of the crafts on Craft Wars? Which has been your favorite? 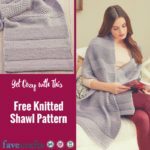 August FaveCrafts Radio is Coming up! 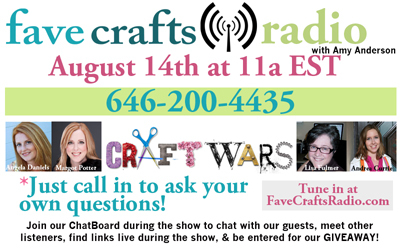 Don’t forget to join us for our Craft Wars edition of FaveCrafts Radio coming up August 14th! We’ll be talking to Craft Wars vets Lisa Fulmer, Andrea Currie, Margot Potter, and Angela Daniels! You can even call in and ask our guests all your juiciest Craft Wars questions. How cool is that? Just call 646-200-4435 on August 14th between 11am and noon EST to get on the air! Have your questions ready. 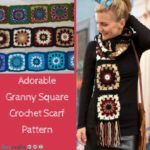 Did you miss last month’s episode of FaveCrafts Radio? No worries! You can listen to all the past episodes in the archives at FaveCraftsRadio.com. Craft Wars: Interview with Margot Potter! Last week’s episode of Craft Wars was a Christmas extravaganza! Aptly named “A Christmas Craft-tastrophe” this episode had contestants scrambled to create festive wreaths, with ugly sweaters, and Christmas trees with shipping materials. Somehow they still managed to create some wonderful crafts. 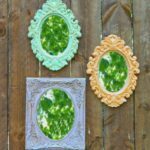 Here at FaveCrafts we got the scoop from crafter extraordinaire Margot Potter and got a chance to talk to her about the show and her experience. 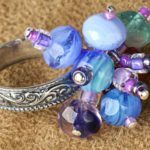 Why do you call yourself “the impatient crafter”? I am an incredibly impatient person, it’s my biggest weakness. About eight years ago, I had an epiphany and realized that my impatient approach to creativity was actually my gift. That ability to find the path of least resistance is the key to my most innovative ideas. Plus, we’re all time challenged these days, so the brand seemed to have a lot of viability and resonance. Once I thought of it, I knew I was on to something big! Do you think that helped you in the pop craft challenge? Have you ever been in a similar time constraint before? Yes! I can edit my ideas quickly, that was a big help. KISS! 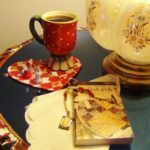 I am a professional designer and author in the craft industry, so I work to incredibly fast deadlines on a regular basis. It definitely helped, but honestly one hour is just not enough time! Still I’m proud of what we accomplished. I would hang that wreath on my door. How did your crafting background prepare you for this competition? I think my theater background was a bigger boost, because I’ve worked on a lot of sets and I have a sense of what would look good on stage or camera. I knew bold and vibrant would read better. The crafty part came in the decorations, paper flowers, notched and glittered ornaments, and rolled rosettes. Knowing how to do things that have impact and are simple to execute was a big boost! You chose Mr. Potter as your assistant, was he a crafter before he met you? Was it hard working under pressure with him? I met my husband years back when I went into his bead store/gallery in Pittsburgh to buy crimp beads. We owned a bead store and gallery later together, so we’ve been in the creative biz since we met. He is a crafty guy and has a great eye for design, but he hates people knowing that. He’s more of a behind the scenes person, I had to drag him into this. He’s used to that though, I’ve dragged him into all sorts of wacky things over the years. I’m kind of like Lucy Ricardo. Thankfully he is not like Desi, he’s calm and collected. It was great working with him, because he stays cool when I get flustered. We make a great team. I loved how you used lots of color and sparkle in both your crafts. How would you describe your design style? Was it hard to stay true to that through the challenges? I like to say that my style is eclectifunky and retrofabulous. I don’t have a single guiding aesthetic, because like fashion and trend it’s ever shifting. 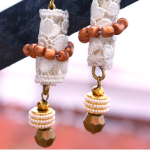 I love all things vintage, so that’s always a part of my work. I am easily bored, so my body of work reflects that restless creativity. I think more like a high fashion designer, thematically. One season it’s glitter and pop art colors, the next it might be understated elegance. I will say, it may be funky sometimes, but it is rarely boring! I think that definitely came out in the show! What tool was your lifesaver during the competition? I have to say that without hot glue, this show would be impossible. I really don’t use it much in my normal life, because I’m craftastrophe proned. I even have a regular Today’s Craft Casualty update on my Facebook page! Somehow, I did not get burned during the show! Huzzah! I loved how you made those easy fabric rosettes for your wreath. Any more awesome crafting tips you would like to share? Craft with your heart, color outside of the lines, try new things and don’t be afraid! Look for vintage craft magazines every chance you get, the BEST tips are in those pages. You can’t believe how much cooler the crafts were back in the 1940s-60s. I bow down to the greatness of crafters past! How can Craft Wars benefit for the crafting community and could this show transform crafting? A few years ago the networks shifted gears and decided that crafting was dullsville. Even using the word ‘craft’ was taboo for production companies pitching shows. But the winds of change are always blowing and if this show does well, new shows will have a chance of being produced. It’s exciting stuff. I have been waiting to pitch my show ideas and so for me, personally, it’s a harbinger of possibility. No one show is going to appeal to everyone, but if this gets people crafting like Cake Boss got people making cakes, well hello and hallelujah! I’m a Pied Piper of Creativity, I love seeing people give themselves permission to be creative and more than that, to embrace the idea of “Live Handmade.” Viva los crafts! Tune in tonight at 8/7c for a brand new episode of TLC’s Craft Wars! Have you started making Christmas crafts yet? Craft Wars Interview with Winners Andrea and Lisa! It was so fun to watch the creative feats of the contestants on last week’s episode of Craft Wars! The theme was Altar or Falter and the contestants were challenged to create a keepsake box using locks and keys (in only an hour!) and a wedding display made of old jeans, baby blankets, candlesticks and wedding invitations. Here at FaveCrafts we were extremely impressed by the crafty creations of the winning duo, Andrea Currie and Lisa Fulmer (congratulations ladies!). We were excited to ask these crafting queens some questions about the show, their experience and their favorite crafting tips! Have you two ever worked on a project together before the show? Lisa – Andrea and I did do one webcast together here at my house where we did a pop-craft on the spot for everyone. We made these funny tiaras for each other that lit up with little battery-operated twinkle lights, it was a riot! Andrea is my heart, we truly are cut from the same cloth. Lisa, how long did you ponder going on the show as Andrea’s partner? Or was it an instant “yes”? Lisa – Andrea barely got the words “I need to ask you something” out of her mouth before I said yes—I would do anything for my crafty sistah! I was honored and so happy for the opportunity. Andrea, I saw that your husband made you some good luck shoes for the show, what’s it like living with a man crafter? Andrea – Those sapphire glittered shoes are the third pair of glittered shoes that Cliff has created for me! However, I consider these blue gems the luckiest of all 😉 Living with a man crafter is so fun because I’m not the only one covered in glitter and glue! It’s also nice to have a spouse that doesn’t give you weird looks when you ask for help with weird projects like giant paint chip valentines. Did you have any strategy before you started? Was there any sort of plan going in? Andrea – It was nerve-wracking to not be able to plan anything beforehand. I told Lisa before the show that no matter what they threw our way we had to think out of the box and create projects that were whimsical and fun. The only thing we had control over was to trust our creative instincts and our many years of combined crafting experience. In the end, it was those things that helped us quickly adapt to each challenge and bring home the win! Lisa – Andrea and I have complimentary skills and styles, plus we always seem to be inside each other’s head, so we made a great team! What part of the challenge was the hardest? Andrea – By far the pop craft challenge was the hardest. I never thought an hour of my life would go by so quickly. My heart was racing a gazillion miles a minute and I think I forgot to breathe too! In the middle of the pop craft we were so far behind and I really thought we weren’t going to be able to finish it. Luckily, we managed to pull it all together into a cute little gnome home keepsake box. Lisa – The pop craft was the single most exhausting hour of my whole life! 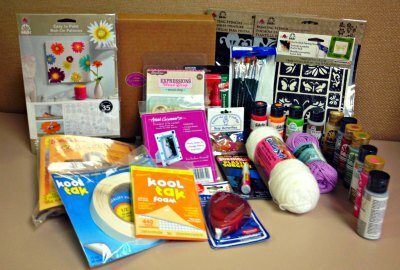 Andrea – I’m giving Lisa half of the loot and I plan to use my half to create my dream line of craft products and designs! Lisa – I’m so grateful for this gift. I will be using the money to build my marketing communications and consulting business. What’s the one crafting tool you can’t live without? Lisa – Lots of really good scissors in all shapes and sizes. I have a pair handy in every nook and cranny of my house. That use of the aluminum foil on the punches was smart. Do you have another crafting tip you can share with us? Andrea – Why thank you! Another good tip is to freeze hot glue sticks 15 minutes before use so that you don’t get those hot glue gun strings that the Craft Wars judges hate so much. Lisa – I never waste paint. When I’m done with a project, I swipe every last bit off my brushes and mop up every drop from my palette by brushing small pieces of fabric or art paper with the color. I can use these later in fiber art, mixed media collages, and cardmaking. I also keep large sheets of art paper and fabric on hand to use whenever I’m spray painting, misting, and stenciling. Capturing all those stray spurts and smudges on a nice foundation can be the beginning of something really cool! Make sure you catch the next episode of Craft Wars on Tuesday on TLC! I can’t wait to see what the contestants make this week! Are you a fan of Craft Wars?